Atticus Wynn and Rosemary Sanchez, newly engaged private investigators, have seen the dark and violent side of life, but nothing has prepared them for an explosive murder investigation that threatens to tear their relationship apart. They struggle to solve a case that as a best result could leave them in prison or dead. Atticus’s manipulative ex-girlfriend bursts back into their lives wielding a secret about Rosemary’s family. She exploits the fact to force the couple into investigating the execution-style slaying of her lover. The case thrusts Atticus and Rosemary headlong into the world of human trafficking and drug smuggling, while rendering them pawns in Tijuana Cartel captain Armando Villanueva’s bloody bid to take over the Cartel. 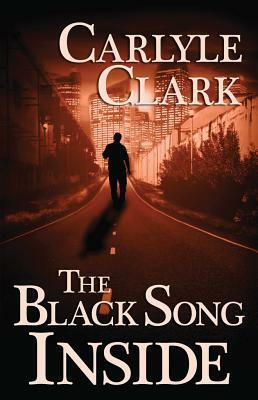 The Black Song Inside is a vivid crime thriller rife with murder and madness, melded with gallows humor and the heroism of two flawed and compelling protagonists. If they can save themselves, they may learn the nature of redemption and the ability to forgive. The Black Song Inside is darker, grittier than what I usually read. It feels real, with gangs and drugs an human-trafficking, a glimpse into a world that I don’t peak into very often. I liked how descriptive Clark was, he made you see and hear the setting, the event, rather than just telling you about them. It can be a bit harsh, gruesome, and the language is sometimes coarse, but it fits the characters and the story. Atticus and Rosemary are pulled into the investigation and have no choice but to solve the case, otherwise they are going to end up dead. I love Rosemary. She’s a true heroine. She served in Iraq, lost part of her leg, has PTSD, but never feels sorry for herself. I like how she interacts with Atticus two, they make a great couple and team. Atticus has issues too, has seen and done things that color how he looks at the world. The other characters, from the drug dealers, Rosemary’s brother, the ex-, even “The Priest,” a crazy killer, are all well-done, although not as compelling as the two main characters. The plot is tight, with several twists and turns. It starts a little slowly, but then picks up and heads full-speed to the end. It’s definitely worth reading, although I can’t say I loved it. It’s just a bit dark for me to really say I enjoyed it. I found it gripping and I enjoyed the thread of black humor that ran through it. Sounds like a book I’d probably enjoy just not at the moment. Great review, thanks for the recommendation. Thank you for the very nice review, Carol! Hope you find the time to “enjoy” it Tracy.